As I write this update I am on a long flight back from Washington, D.C. where Jake Yarberry (President-elect) and myself just participated in a whirlwind of legislative activities. We flew across the country to participate in AND’s Public Policy Workshop 2017 (#PPW2017) on behalf of NvAND and all dietitians across Nevada. Public Policy Workshop is a change for AND affiliate Public Policy Coordinators, DPG/MIG Public Policy Coordinators, ANDPAC representatives and those interest in policy to come together, learn and storm Capitol Hill. On Sunday, June 25th, we participated in a conference to better understand how we as dietitians and constituents can better impact legislation that promotes our profession and improves the nutrition of our nation. My toolkit is full of ways for us to have a positive impact on nutrition in Nevada and my mind is swirling with ideas for us to implement. The biggest part of PPW 2017 is the change to storm Capitol Hill, hundreds of dietitians united under a single cause. When we arrived at Capitol Hill on Monday, June 26th to meet with our 2 state Senators and 4 U.S. State Representatives, we had a few objectives we wanted to achieve on behalf of AND and NvAND. Promote AND’s initiatives to urge our legislators to continue to fund the Farm Bill and the Prevention and Public Health Fund. Both programs provide valuable funding to local organizations who provide nutritional services and education to the Nevada Community. 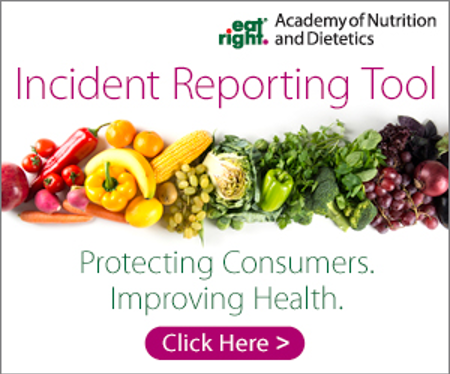 Ask our legislators to Co-Sponsor Senate and House Resolutions Recognizing the 100th Anniversary of the Academy of Nutrition and Dietetics (S. Res. 75 and H. Res. 161). While this may seem small it is a way for our legislators to make it known to America who we are, what we do and that we matter. Further push The Treat and Reduce Obesity Act of 2017 (H. Res. 1953, S. 830), the focus of NVAND’s Legislative Day 2017 this past April, which would expand coverage to allow dietitians to provide intervention for patients with a diagnosis of obesity. Open a line of communication between the offices of our legislators and dietitians so if they have any questions or concerns regarding nutrition, we are their first thought for input on the matter. Take part in the Action Alerts sent out by the Academy. Currently there are 3 Action Alerts, found at EatRightPro Action Center that tie in to what we discussed with our legislators in Washington, D.C. As persuasive as Jake and I are, our legislators need to know that we as RDs and DTRs ALL fully support AND’s efforts. We currently have a 6.6% participation rating when it comes to Action Alerts over the past year. That is an average of 37 people writing communications to their legislators on AND supported initiatives in a state of 2.94 million. Is it a wonder nothing ever changes? Know who your legislators are. This seems basic but how many of you reading this have no clue who represents your district of Nevada in Congress? Or who represents your interests in the State Senate? The EatRight Pro Action Center(eatrightpro.org/action-center) and Govtrack.Us can help you figure those things out. Visit you U.S. Representatives and Senators at their home offices. In August, every member of Congress returns home and statistically, as reported by their legislative staffers, these breaks are the best time to meet with them in person. It is as simple as calling or sending their office an email. When I prepared for my visits in Washington, D.C. I received appointment confirmations the same day I requested it. The sweet spot in planning is to ask 3-4 weeks before you want to see them. Attend town hall meetings and local events. Better yet, let’s attend them together as a group. Let’s have signs and posters that shout, “Dietitians Count Carbs Better” and “All Broccoli is Beautiful” or simply “Nutrition Matters.” Legislators want to hear from their constituents! I can be at all their events but since I can’t vote for them, they do not work for me. But they do work for many of you. If you keep me informed of Town Hall meetings in your district we can reach out to everyone and form a pack of dietitians and our message will be hard to ignore. My goals for my time in office are to increase Action Alert participations to 10%, meet with our Federal legislators quarterly to increase visibility and get more of you members involved in policy. 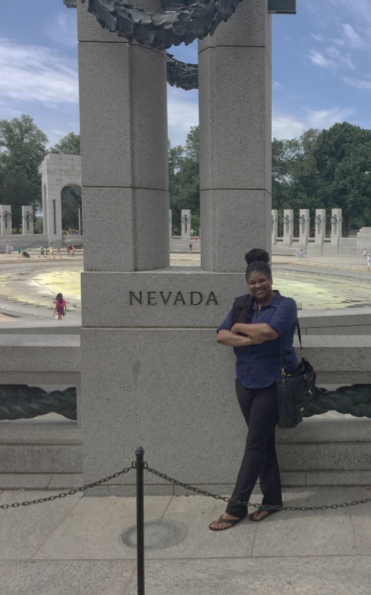 Reach out to me any time, PublicPolicy@EatRightNevada.org, I want to hear your thoughts and opinions on the efforts of the Public Policy Committee and myself as Public Policy Coordinator. I am here for all of us but I can’t do this alone. I want to keep updating you NvAND members about what is happening in Public Policy and how we can all make a difference. This is not about politics, it is not about what side of the party lines you fall on, this is about nutrition. Everyone needs to eat and everyone needs to eat healthy if we are ever going to change the diseased state of our nation. 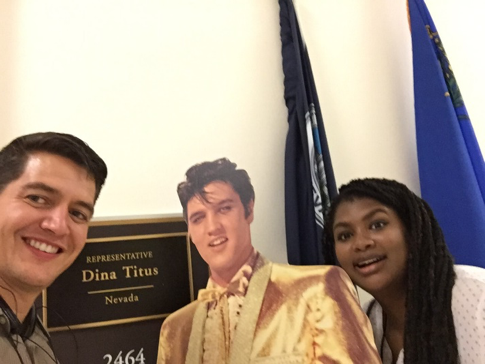 Congresswoman Dina Titus has an easily located office on Capitol Hill, it's the one with a life-size Elvis cutout by the door. 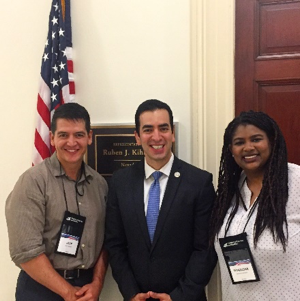 Jake Yarberry RDN, LD, Congressman Ruben J. Kihuen of Nevada's 4th District, Mandisha Waiters, RDN, LD.